The internet is full of websites that give information on survival topics, including food storage. There are dozens and dozens of books that will teach you “the right way” to store food and YouTube videos galore. 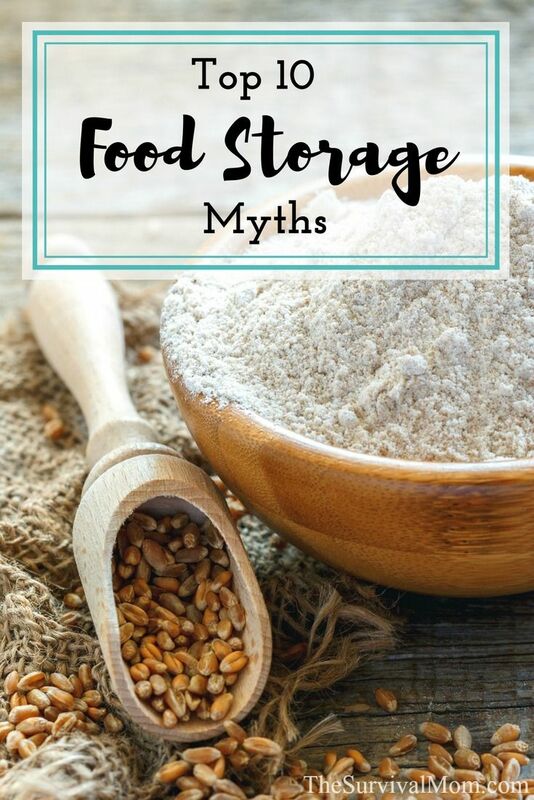 Most contain valid, trustworthy information, but mixed in with that are a number of food storage myths that many people accept without question. Here are 10 that I take issue with, and I explain why. By the way, following Myth #10 are 2 short videos that review these myths. When I was researching foods typically eaten during the Great Depression, I noticed that many of them included sandwiches of every variety. So it makes sense to stock up on wheat, which, when ground, becomes flour, the main ingredient to every bread recipe. 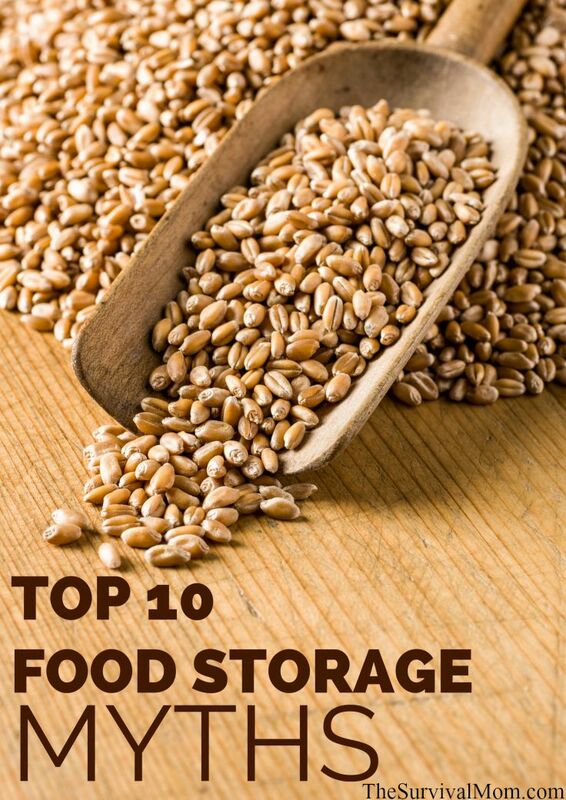 Unless you or someone in your family has issues with eating wheat, it’s definitely a frugal and versatile building block for your food storage pantry. Since the time of the Great Depression, millions of people now have various health issues when they consume wheat. From causing gluten intolerance to celiac disease our hybridized wheat is a whole ‘nother animal that our great-grandparents never consumed. There’s a learning curve with wheat that a lot of people aren’t prepared for. A survival expert tells them to stock up on at least 300 pounds of wheat per person, per year, they do, and then wonder what they’re going to do with all that wheat! That’s exactly what happened to me when I first began prepping in 2008!! It’s not that hard to learn how to grind wheat to make flour and then use the flour to make bread, crackers, tortillas, etc. and it certainly isn’t difficult to cook a cup or two of wheat in water, oatmeal-style, and end up with wonderfully versatile wheat berries. It’s just that a lot of new preppers don’t think about how they will use that wheat before buying it and, depending on their family’s eating habits and preferences they may end up buying far more than they will ever eat. I’m not saying you shouldn’t store wheat, and, in fact, I have several hundred pounds of it myself. The emphasis on wheat and the many hundreds of pounds recommended by many food storage experts may not be a good fit for everyone. Myth #2: Beans last forever. While it’s true that beans have a long shelf life, they have been known to become virtually inedible over time. Old-timers have reported using every cooking method imaginable in order to soften the beans. A pressure cooker is one option but, again, some have told me that doesn’t even work! Another option is to grind the beans and add the powdered beans to various recipes. They will still contain some nutrients and fiber. Over the years, I’ve stocked up on cans of beans — beans of all kinds. I’m a big fan of beans. They retain their nutrients in the canning process and are already cooked, so there’s no need to soak, boil, pressure cook, etc. You can always home can dried beans, and if you have beans that have been around for more than 10 years or so, canning them is a super simple process and ensures they won’t become inedible. If you do end up with very hard beans that seem to be permanently inedible, try the method in this article to rejuvenate them. Myth #3: If they’re hungry enough, they’ll eat it! Have you ever fallen in love with a recipe that was easy to make, inexpensive, and your family loved it? You probably thought you’d finally found The Dream Recipe. And then you made it a second time, then a third, then a fourth. About the 8th or 9th time, however, you may have discovered that you had developed a mild form of food fatigue. Suddenly, it didn’t taste all that great and your family wasn’t giving it rave reviews anymore. When it comes to food storage, don’t assume that someone will eat a certain item they currently hate, just because they’re hungry. If you stock up on dozens of #10 cans of Turkey Tetrazzini, sooner or later the family will revolt, no matter how hungry they are. The secret to having a well- balanced food storage pantry is to have versatile ingredients that can be combined in dozens if not hundreds of different ways in simple recipes. Food fatigue will never become an issue. Myth #4. All I need is lots and lots of canned food. There’s nothing wrong with canned food. In fact, that’s how I got started with food storage. However, canned food has its limitations. A can of ravioli is a can of ravioli. You can’t exactly transform it into a completely different dish. As well, canned food may have additives that you don’t care to eat and, in the case of my own kids, tastes change over time. I had to eventually give away the last few cans of ravioli and Spaghetti-O’s because my kids suddenly didn’t like them anymore. Be sure to rotate whatever canned food you have, since age takes a toll on all foods, but, as I’ve discovered, on certain canned items in particular. My experience with old canned tuna hasn’t been all that positive, and certain high-acid foods, such as canned tomato products, are known to have issues with can corrosion. Double check the seams of canned food and look for any sign of bulging, leaks, or rust. Lightly rusted cans, meaning you can rub the rust off with a cloth or your fingertip, are safe to continue storing. However, when a can is badly rusted, there’s a very good chance that the rust has corroded the can, allowing bacteria to enter. Those cans should be thrown away. Worried about the “expiration” date on canned food? Well, those dates are set by the food production company and don’t have any bearing on how the food will taste, its nutrients, or safety after that date. If the food was canned correctly and you’ve been storing it in a dry and cool location, theoretically, the food will be safe to consume for years after that stamped date. Myth #5: I can store my food anywhere that I have extra space. Yikes! Not if you want to extend its shelf life beyond just a few months! Know the enemies of food storage and do your best to store food in the best conditions possible. TIP: Learn more about the enemies of food storage: heat, humidity, light, oxygen, pests, and time. I emphasize home organization and decluttering on this blog, mainly because it frees up space that is currently occupied by things you don’t need or use. Start decluttering and then storing your food in places that are cool, dark, and dry. Once you begin building your food storage pantry the smart way, you’ll be glad to have that extra space. Myth #6: My food will last X-number of years because that’s what the food storage company said. I have purchased a lot of food from very reputable companies over the years, Thrive Life, being my all-time favorite. Most of these companies do a great job of processing food for storage and then packaging it in containers that will help prolong its shelf life. However, once the food gets to your house, only you are in control of how that food is stored. Yes, under proper conditions, food can easily have a shelf life of 20 years or more, but when it’s stored in heat, fluctuating temperatures, and isn’t protected from light, oxygen, and pests, and never rotated, it will deteriorate quickly. NOTE: When food is old, it doesn’t become poisonous or evaporate in its container. Rather, it loses nutrients, flavor, texture, and color. In a word, it becomes unappetizing. This is why it’s important to focus your food storage on foods with a naturally long shelf-life. You can extend the shelf-life of many foods by repackaging them yourself. I explain how to do that in this article. Myth #7: Just-add-hot-water meals are all I need. There are many companies who only make and sell just-add-hot-water meals. In general, I’m not a big fan of these. They contain numerous additives that I don’t care for, in some cases the flavors and textures and truly awful, but the main reason why I don’t personally store a lot of these meals is that they get boring. Try eating pre-made chicken teriyaki every day for 2 weeks, and you’ll see what I mean. Some people don’t require a lot of variety in their food, but most of us tire quickly when we eat the same things over and over. These meals have a couple of advantages, though. They are lightweight and come in handy during evacuation time and power outages. If you can boil a couple of cups of water over a rocket stove, propane grill, or some other cooking device, then you’ll have a meal in a few minutes. TIP: Store a few days worth of just-add-water meals with your emergency kits and be ready to grab them for a quick emergency evacuation. Be sure to also pack a spoon or fork for each person and a metal pot for meals that require cooking over a heat source. However, for a well-balanced food storage pantry, stock up on individual ingredients and fewer just-add-hot-water meals. Myth #8: I can stock up on a year’s worth and won’t need to worry about food anymore. Will you know how to prepare it? Will you have the proper supplies and tools to prepare the food? Did you store enough extra water to rehydrate all those cans of freeze-dried and dehydrated foods? Do you have recipes you’re familiar with, that your family enjoys, and that use whatever you’ve purchased? What if there’s an ingredient a family member is allergic to? Does everyone even like what you’ve purchased? Have any of the containers been damaged? How do you know if you haven’t inspected them and checked them occasionally for bulges and/or pest damage? If you’ve purchased a pre-packaged food storage supply, the contents of that package were determined by just a small handful of people who do not know your family, your health issues, or other pertinent details. These packages aren’t a bad thing to have on hand. Just don’t be lulled into a false sense of security. Do it the smart way — focus on foods that are versatile, familiar, frugal, and have a long shelf-life. You can’t go wrong with a food storage pantry that is build around the personalized needs of your family. Myth #9: Freeze dried foods are too expensive. Yes, there is a bit of sticker shock initially when you begin to shop online at sites like Thrive Life, Augason Farms, and Emergency Essentials. If you’ve been used to paying a few dollars for a block of cheddar cheese and then see a price of $35 for a can of freeze-dried cheddar, it can be alarming. However, take a look at how many servings are in each container and consider how much it would cost to either grow or purchase that same food item and preserve it in one way or another, on your own. The 3 companies I mentioned all have monthly specials on their food and other survival supplies — that’s how I ended up with 2 cases of granola from Emergency Essentials! 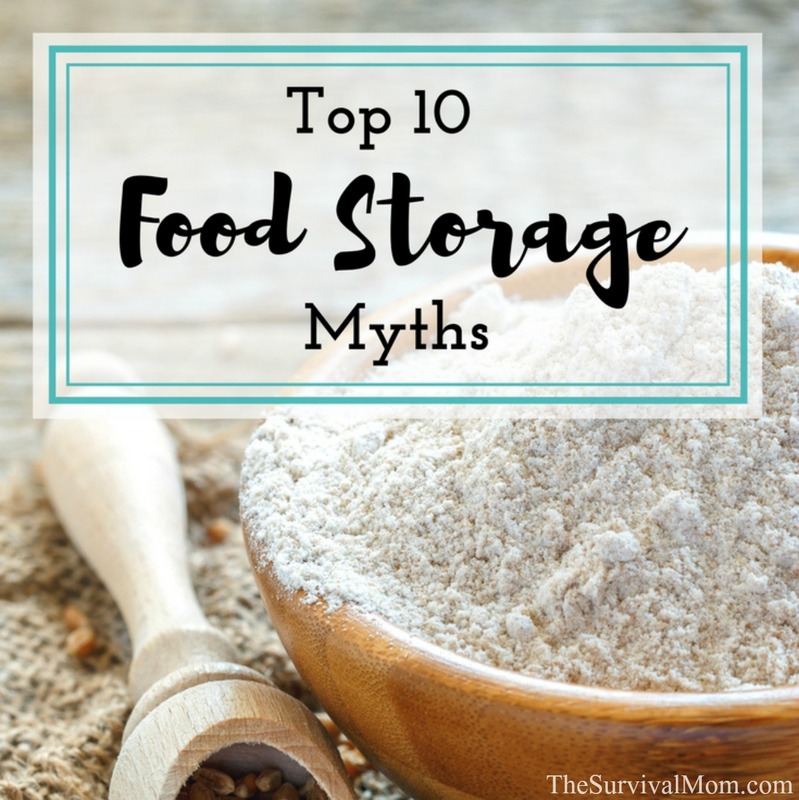 Myth #10: This expert’s food storage plan will fit my family. The very best food storage plan is the one that you have customized yourself. By all means, use advice given by a number of experts. Take a look at online food calculators, but when it’s time to make purchases, buy what suits your family best. What one person thinks is ideal for food storage may leave your kids retching. Wheat is not a GMO product, corn and soy beans are, but wheat is not. Wheat can also be sprouted to help with your vitamin C needs when other sources are not available. You’re right. I’ll make that correction. Wheat still has become something almost toxic to lots of people. It’s a hard call — do I stock up on wheat if I know it affects my health or figure that eating bread will keep me alive in a worst case scenario, even if I get sick eating it? It may keep me *alive* for a while, but I will sicken mightily after a day or two. I’m stocking up on rice, and perhaps corn, since I’d die sooner from the extreme diarrhea that comes with being intolerant to wheat. TMI, sorry–but that’s the reality for those with Celiac and other intolerances to wheat. Many long-time food store-ers have told me they wished they had stocked up on more rice than wheat. That would include me. I have read you book. Its beside my bed. I refrence it almost daily. My husband and I have been prepping for years!! I just stumbled across this site and I am so excited!!! MIx corn meal with buttermilk (or buttermilk powder & water). Let it sit, covered, in a cool, dry place for several hours before making your cornbread. You will get a little of the tang you miss. round-up they spray on it. Look for organic wheat and your “gluten” issues disappear. GMO wheat is what I am allergic too. My body does not deal with it well. Non GMO wheat no problem. I just finished off a bucket of stored wheat berries and opened up another, but it has weevils or some such insect in it (black, about the size of ants, but with wings). So when you buy wheat, put it in the freezer for about 24 hours to kill any insect eggs that might be in or on it. Then allow it to come back to room temperature before you pack it away in storage. All these dang insects will survive even if humanity has become extinct. Yes, that’s good advice. Make sure the wheat is in an airtight container when you put it in the freezer. I had a similar issue with weevils in rice. Instead of cold, I tried heat, and not wanting to waste energy doing the job, I just popped the tubs of rice into my car parked in a hot parking lot on a hot summer day… to sit all day. The weevils in all but one of the tubs were completely killed – as (apparently) were any eggs in there – as they never re-infested. In researching, I was informed (hopefully correctly) that eating the remaining rice was safe from a toxicity standpoint. The only issue was my vegetarian leanings, in eating rice populated with weevil cadavers (and general grossness), but I merrily discovered that dead weevils float when put into water to cook – where rice sinks. This allowed a sort of weevil-winnowing opportunity before use – and helped re-vegetarianize my food… and make it a bit less “gross”. Beans! Oh my goodness. So my husband and I had been slowly building up our food storage. We had a small closet filled with #10 cans of various things including a variety of dried beans. Then tragedy hit some family members and we ended taking in 5 adults/teens into our house. We threw down air mattresses and busted out the food storage. They were homeless, jobless, moneyless. We figured it would be okay for a while and we could give them a chance to regroup. At least some of everything in the food storage got used except the beans. I had my issues with the whole situation in general (we had to kick them out after a year) but there was an incredible lesson I learned, what worked and what didn’t in our food storage. There were some things that were used quicker than I thought and some things that didn’t get used as fast. Here’s what I learned. Beans, no one liked and they take a lot of effort to get ready compared to other things, no good. Flour, barely got used, didn’t have the rest of the ingredients to make bread and no one was willing or able to make bread even if I got the rest of what we needed, was used minimally. Oatmeal, great but get a variety of oatmeal flavors or have a variety of things to flavor it with, it gets old quick if you don’t. Rice, quick and easy and versatile, used a ton of it, should have had more. Wish we had drink mixes, water gets old after a while. I’ll clarify something. All 5 of them were jobless but my husband and I were still working full time. So if they weren’t willing to make it I wasn’t going to put forth the effort for them. I ‘think’ if somewhere along the line I was jobless and needed to put in the effort, I would probably make the beans but I don’t have the knowledge to make bread so large amounts of flour would still be a waste. Wheat contains a protein, Gluten, which a small number of people can become allergic to. Just like shellfish,bee venom or any protein. It is not a toxin and the number of people with true sensitivity is very small. My understanding of today’s problem with wheat, is that it now has so much more of the gluten protein in it these days. Much more than what we grew up with. So the toxicity occurs trying to digest such an increased level of the protein. Is it true that RYE may be overall better? Also, what stopped me from eating ANY wheat, is the reason that when they harvest the wheat the also spray it with GLYPHOSATE to make it dry faster!!! I put 1/2 cup dry beans in a pint jar. Fill with boiling water, leaving headspace. Process 4 hours in water bath (I don’t use pressure cooker, but I’m sure you could look up the time for processing). When they come out, beans are fully rehydrated. I season teh kidney beans for chili and presto, home canned chili beans. You can do navy or northern for ham and bean soup. The best part, you don’t soak overnight and cook all day. I do the same thing with dried beans. With store bought cans, I dehydrate those when they get near the exp. date, then vacuum seal with an o2 absorber and a desiccant pack. This post reminds me of that ground field corn I have sitting around. It must be a decade old by now–I got it from my late grandfather. Of course, it was stored in a freezer for most of that time. It’s still edible, so I have a bowl from time to time, but the taste makes it pretty hard to choke down, haha. I like your idea of introducing some variety in the form of freeze-dried foods. I’m sure they’ll be well worth the cost in the long run. However, I suspect food prices are only going to continue to rise (and that’s not even considering inflation). If nothing else, stockpiling food ASAP makes a lot of economic sense. Diotomacious earth is no toxic to people and animals but kills insects of all kinds. Add this to all grains and you will have no insects to eat what you need to eat later. Purchase a dehydrator and dehydrate your own garden or the things you like on sale from the freezer in bulk much less expensive. No sprays and you know what is in it. Put it in bottles, pop bottles, water bottles any food grade bottle that comes into your home and have it in a cool storage and some on the stove blended and put it in everything is it great no one sees but everyone is nourished. Variety is endless, store other grains and learn to use them, amaranth, millet, tiff, Quinoa, many more. Chief Brad from BYU teaches you how to cook with them sososo goood. Look for what you need to learn their is so much available at our finger tips. Try learn to garden so you can have the foods you like, garden in doors with a light it is great we have had tomatoes from our own plants all winter and we have two feet of snow and more coming out side. Being snowed in is no problem we know when winter comes prepare and you do not fear it is an adventure even a rest from the Kayos of the world. This is a fantastic article that definitely explains the ins and outs of food storage. I’m celiac so we don’t store a lot of wheat or wheat based products, but there are many other grains such as corn, rice, quinoa etc that we use in it’s place! Lisa, I am an emergency preparedness consultant in Fruit Heights, Utah. I’ve learned so much by reading articles written by you and Daisy. May I have your permission to send some of your articles to 50 serious prepper families in my community? Thanks for the kind words, Bob. Yes, you’re welcome to share my articles. Great article! I am in the beginning stages of prepping and stocking my pantry and this post has some great info. Thanks! Lisa, I didn’t know much about this food storage myth. Learn something new today.